RingTV.com and Cleeng today announced a partnership to stream the most anticipated boxing showdown of the year as Lineal Middleweight World Champion Canelo Alvarez (49-1-2, 34 KOs) takes on WBC/WBA/IBO Middleweight World Champion Gennady “GGG” Golovkin (38-0-1, 34 KOs) in a 12-round rematch Saturday, September 15. Canelo vs. GGG 2 presented by Golden Boy Promotions and GGG Promotions, will air live on www.RingTV.com Pay-Per-View in the United States starting at 8:00 p.m. ET / 5:00 p.m. PT, from the T-Mobile Arena in Las Vegas, Nevada. The PPV broadcast will be available to watch in HD on RingTV.com & CaneloGGG.com (video promo). RingTV.com will be the online programming platform for purchasing and viewing the Pay-Per-View, with Cleeng providing all the supporting technology to drive the Sept. 15 event programming. There have been only eight editors-in-chief in the magazine’s history. Doug Fischer is the current editor. The Ring began awarding championship belts in 1922. The first Ring belt was awarded to heavyweight champion Jack Dempsey, the second to flyweight champion Pancho Villa. The magazine stopped giving belts to world champions in the 1990s, but began again in 2002 when it launched its new championship policy intended to reward fighters who, by satisfying rigid criteria, can justify a claim as the true and only world champion in a given weight class. Let the games begin! Lineal Middleweight World Champion Canelo Alvarez and WBC/WBA/IBO Middleweight World Champion Gennady “GGG” Golovkin will be featured in an 8-bit boxing game which will launch on Tuesday, Sept. 4 — 11 days before their eagerly-awaited world championship rematch. Golden Boy Promotions and GGG Promotions have partnered with GameCommerce, a global leader in Brand Playables, to design and create the interactive game. The game incorporates images of fighters Canelo and GGG, providing a fun 8-bit rendering representation of their rematch. Last year, on Mexican Independence Day, in front of a record crowd, Canelo and GGG fought to a controversial draw. The fighters resume their fierce and bitter rivalry on Saturday, Sept. 15 at T-Mobile Arena in Las Vegas, Nevada. It will be produced and distributed live by HBO Pay-Per-View® beginning at 8:00 p.m. ET / 5:00 p.m. PT. In the game, the player chooses which fighter they want to be, and can even use boxing moves like a hook, a cross, an uppercut or a block to attack or defend against the opponent. This fun and interactive boxing game will be launched on Snapchat, Facebook, Instagram and Twitter. “Boxing is such a visceral sport, especially with such dramatic fighters as Canelo and Golovkin. Through this engaging game, people will experience the fight in a lively way in anticipation of the realfight,” said Nagesh Pobbathi, CEO of GameCommerce. Canelo, of Guadalajara, Mexico, is a two world title and lineal champion in the super welterweight division, and has captured the WBC, Lineal and Ring Magazine World titles in the middleweight division. After his historic showdown with Golovkin last year, Canelo promises to defeat Golovkin in exciting fashion to prove that he in the world’s best 160-pounder. “Games are games, and they are fun to play. But I won’t be playing on Sept. 15. I will knock Golovkin out,” said Canelo. Golovkin (38-0-1, 34 KOs), from Karaganda, Kazakhstan, is boxing’s longest-reigning world champion (since 2010). Known for his Mexican style of fighting and his explosive knockout victories, this undefeated boxing superhero will be looking to make his division record-breaking 21st consecutive title defense. “It was fun beating up Canelo in this game. 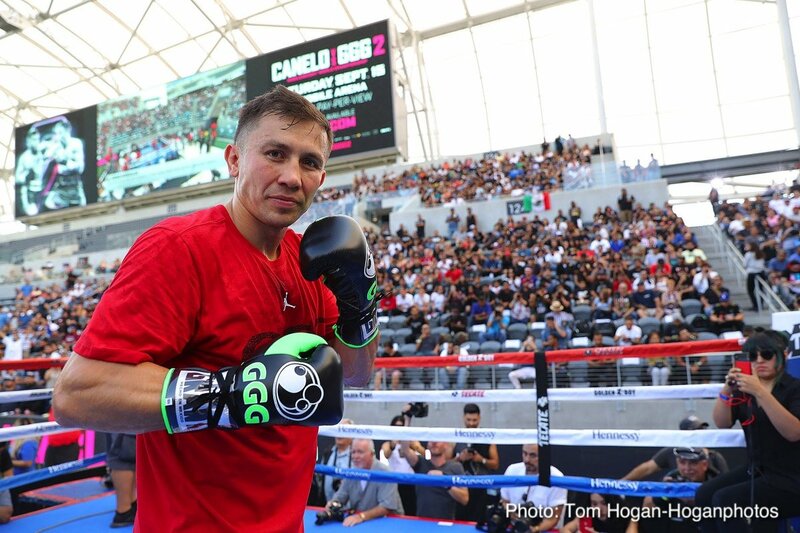 Now I cannot wait for September 15, when we will get really interactive at T-Mobile Arena,” said Golovkin. Canelo vs. GGG 2 is a 12-round fight for the middleweight championship of the world presented by Golden Boy Promotions and GGG Promotions. The event is sponsored by Tecate, “THE OFFICIAL BEER OF BOXING,” Hennessy, “Never Stop, Never Settle,” O’Reilly Auto Parts, Fred Loya Insurance, Interjet, Venom, and Fathom Events. Limited tickets are still available, and are priced at $5,000, $2,500, $2,000, $1,500, $800, $700, and $500, not including applicable service charges and taxes. There will be a limit of eight tickets per person at the $5,000, $2,500, $2,000, $1,500, $800, $700 and $500 price levels. To pay by phone with a major credit card, call 888-9-AXS-TIX (888-929-7849). Tickets are also available for purchase at www.t-mobilearena.com or www.axs.com.